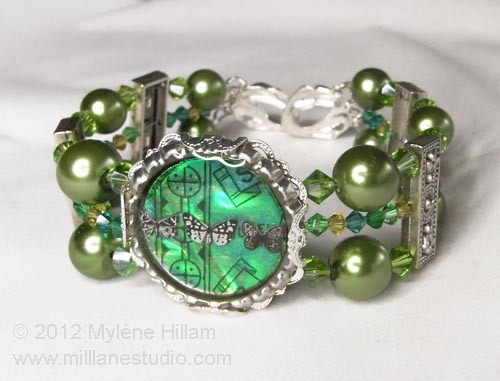 For the second post in my Cousin Corp Week, I've created a multi-strand bracelet using a resin butterfly charm as the focal. You can see how I made the charm here. 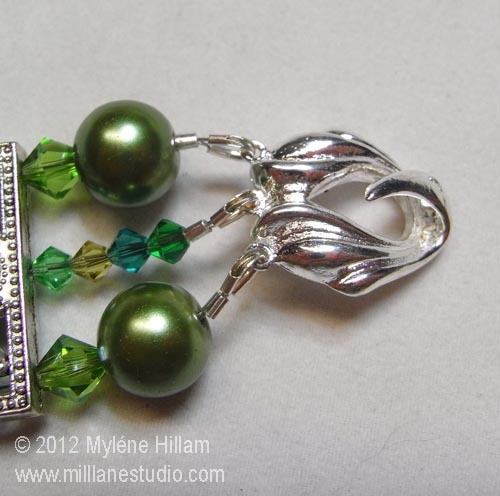 For this project, I've used the Pearl and Crystal mix in green and tied it all together with silver spacers. The first thing that needed to be done for this project was to work out how to incorporate the flat bottle cap charm into a multi strand bracelet. I could have glued one of the silver spacers to the back but they have a high point in the middle and they don't sit flush against the bottle cap back. 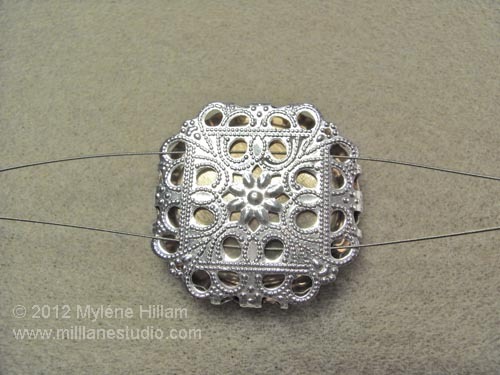 So instead, I decided to wrap it with a square silver filigree from my collection so that I could weave the tiger tail through the back of the filigree to hold the strands in place. 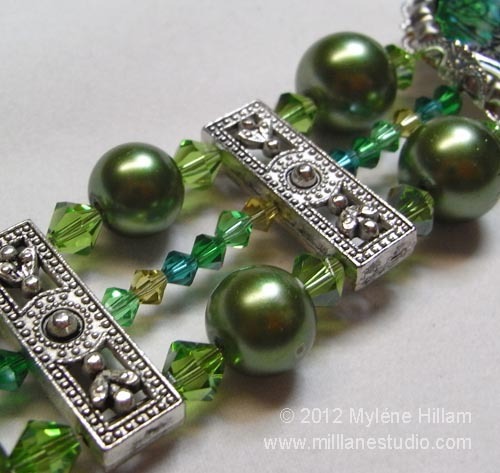 I went for a simple arrangement with the beads and threaded on the pearls interspersed with crystals. 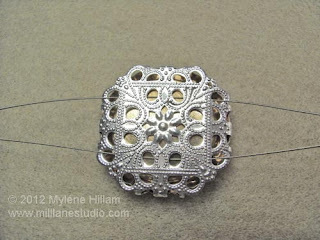 The silver spacers keep the strands firmly in place so they don't twist but they also tie in the silver filigree wrapped focal. It looks quite nice at this point, but it just seems to be missing something. 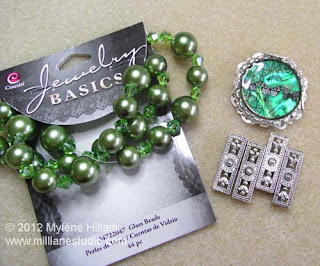 To finish the bracelet I've used a hook clasp from my collection - it makes it really easy to put the bracelet on yourself but you could just as easily use a toggle. I'll be back later with more of Cousin Corp Week. 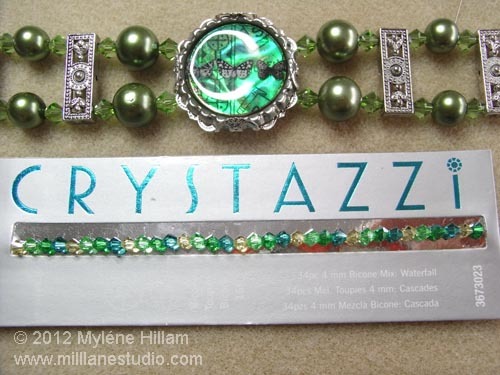 Check back in later to see how else I combine my butterfly charms with the Cousin Corp goodies.